The Redpath Museum, one of the oldest museums in Canada, was opened in 1882 to preserve and display the valuable collections of Sir William Dawson, a noted Canadian natural scientist. Initially it was intended that the museum and its contents should be in the first place for the professors and students of McGill College and University, and secondarily for all the students of Natural Science and for the public. In 1952, the Museum broadened its focus to become effectively a natural history museum for elementary and high school students. In 1971, however, McGill, under extreme financial pressure, dramatically reduced public access and focused on its scientific research and teaching roles. In 1985-86 the doors of the Redpath Museum were once again opened to the general public. With recent additions from the research of professors and their students, we have close to three million objects in our collection. Exceptional aspects of the collections include unique examples of extinct animals, fossils of the oldest known vertebrates, and the second largest collection of Egyptian antiquities in Canada. Many visitors are drawn to the museum purely on the strength of the world cultures (ethnology) exhibits. Three mummies are evidence of the importance that the ancient Egyptian culture placed on life after death, and the display also includes a coffin, painted with hieroglyphics, mummies of various animals and a selection of predynastic Egyptian pottery and stoneware, and a cast of the Rosetta Stone. Other world cultures (ethnology) displays include African musical instruments and masks. There are even displays of rare artifacts created and used by prehistoric cultures. The mammal collection contains many rare species and spectacular skeletons such as the minke whale. By displaying the lion, gorilla and wolf, from our mounted mammal collection, the museum also takes a look at the plight of endangered species and extinction. This is made more poignant by the juxtaposition of specimens of extinct bird species, such as the passenger pigeon and the dodo bird, whose last living members died in the mid 1890's. The rocks and minerals, largely collected at the turn of the last century, are laid out in a fantastic display that shows the richness of the world's quarries. The invertebrate collection allows us to exhibit a wide variety of shells ranging from the small but valuable Imperial delphinula shell to the impressive two meter long giant spider crab. The museum also acts as a resource for schools of the Montreal area, who are always in desperate need of field trips which will contribute to the teaching of science. Seeing and touching the objects for themselves, and marveling at the unexpected beauty of the natural world, allows for a very complete learning experience. The Redpath Museum offers visitors an opportunity to come and explore our incredibly diverse and extraordinary planet. It is a valuable resource for the Montreal community. The Museum is one of the most prominent buildings of the University, looking out over the campus from the north-west corner, in front of the Arts Building. The Redpath Museum enjoys the distinction of having been one of the first Canadian buildings singled out for praise in the international architecture literature. 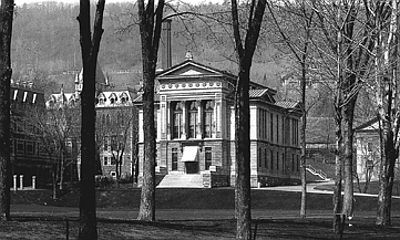 Commissioned in 1880 by that notable benefactor of McGill, Peter Redpath, and marking the 25th anniversary of Sir William Dawson's appointment as Principal, the Museum was designed by A.C. Hutchison and A. D. Steele. They conceived an idiosyncratic expression of eclectic Victorian Classicism, synthesizing ancient and modern as well as European and North American sources to dignify the campus and express the significance of its purpose. The Redpath Museum of McGill University commands attention as an unusual and late example of the Greek Revival in North America.